This research is aimed at harvesting and collating social media data, open source intelligence or publicly available information on political trends, narratives, opinion polls and employing the dataset to forecast the likely winner in Nigeria’s forthcoming presidential election slated to take place on February 16, 2019. Granted there are about 24 candidates in the forthcoming presidential election but realpolitik, pragmatism implies the election would be a two-horse race between two northern Muslims of Fulani extraction – Atiku Abubakar (Peoples Democratic Party, PDP) and Muhammadu Buhari (All Progressives Congress, APC). Naysayers would argue that politics is local; that elections are not won on social media. Despite its flaws, open source intelligence, social media and big data analytics has proven to be veritable tools for inter-alia: predicting social unrest, economic crises, medical epidemic, natural disasters, terrorism and also gauging the ‘political pulse’. It boils down to connecting the dots and using the known to figure out the unknown. This is doable as long as available data is valid, reliable, and there are no unforeseen circumstances that could precipitate a disruption. A 2017 report published on The Conversation titled, ‘’How artificial intelligence conquered democracy’’, depicts how machine-learning systems predicts which United States Congressional bills will pass by making algorithmic assessments of the text of the bill. Caveat: Though an active citizen, good governance advocate, writer is not a card carrying member of any political party in Nigeria and no one commissioned him to embark on this task. My endeavour here as an analyst and an information junkie, is to glean data from overt, disparate sources and try to make an inference. Social media intelligence (SMI/SOCMINT) or social media forensics refers to the stack of tools that allows individuals or organizations to monitor social media channels, conversations, emerging trends. These nuggets of information are analyzed and synthesized into meaningful content and used to make strategic decisions across many disciplines. Just like everything in life, there is a drawback. The danger in social media intelligence (SOMINT) stems from the fact that some of the information are unverified, could have been outright disinformation or weaponized information disseminated by a bot. In our today’s data-driven world, social media has no doubt disrupted the way we communicate and is bracing to disrupt electioneering and by extension, democracy. During the 2016 U.S presidential election, data science firm Cambridge Analytica reportedly plunged an all-embracing advertising campaign to target persuadable voters based on their individual psychology. Similarly, UK Labour party’s successful digital media campaigns during the 2017 general election which saw them gain 21 seats from its Conservative opponents also buttresses the efficacy of social media to politics. An average smartphone user clicks, taps and swipes his/her seductive gadget an amazing 2,617 times a day. The proliferation of smartphones and high rate of internet penetration entails many people are inadvertently addicted to their smartphones and social media. The Nigerian Communication Commission (NCC) says there are 103 million internet users in Nigeria as at July 2018. We also know that Nigeria boasts of the highest Facebook users in Africa; there were 26 million active Facebook users in Nigeria, as at May 2018. A plethora of Nigerians are also active on Twitter, Instagram, LinkedIn and other social media platforms. There are manifold implications: political campaigns, electioneering are no longer the exclusive preserve of traditional mass media/advertising platforms such as television, radio stations and newspapers. Now, cyberspace, social media is also political and campaign battleground. Another import of this is that analysis of social media, open source data, prevailing political narratives, trends, pulse of the country, could hint who Nigeria’s next president would be. Can Social Media Intelligence, Twitter Predict Election Outcomes? ‘’The  election was decided, dominated and directed by social media. Social media played a central role as a watchdog in keeping the integrity of the process. Within minutes of votes being counted at a polling unit, the results were all over social media’’. Buhari led Jonathan whom he defeated during the 2015 presidential election in several opinion polls, including the poll administered by Jonathan’s Special Assistant on Social Media, Reno Omokri and also by online newspaper, Premium Times, JJ Omojuwa, the Africa Independent Television, AIT, World Stage Group. Out of the total 9,206 respondents to the poll, 8,176 Nigerians said they would vote for Buhari. Buhari also bested Jonathan in another opinion poll by Daily Post newspaper. Out of a total of 9,204 votes in the poll, Buhari emerged winner by polling 6,129 votes (66.59 percent) and Jonathan, with 2,516 votes (27.34 percent). Buhari also emerged a winner in another poll conducted by political risk research and consulting firm, Eurasia Group. Buhari reportedly got 60 percent while Jonathan got 40 percent. The dissenting poll was the one conducted by Kevin, Charlyn and Kimberly Associates, a United Kingdom (UK)-based research and political risk consult. Northern Nigeria’s only surviving newspaper – Daily Trust launched a twitter poll on October 12, 2018. The poll asked: ‘’who are you supporting in the 2019 presidential election? Retweet for @MBuhari, like for @atiku. 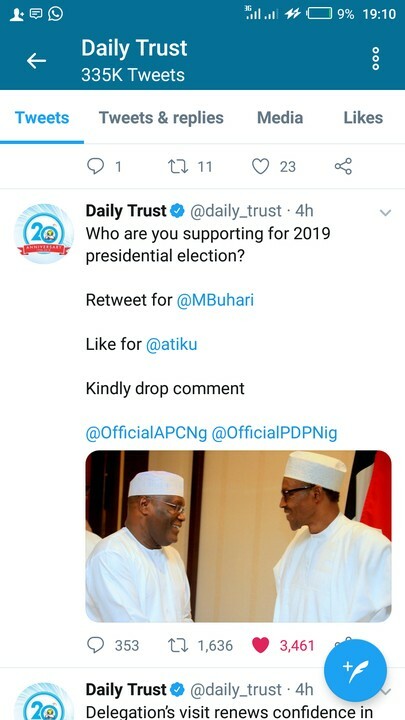 Notwithstanding the unfair advantage of retweet button allocated to @MBuhari by Daily Trust, Atiku trounced Buhari in the poll. As at the time (1920 Hours, October 14, 2018) of writing this report, Atiku had amassed 14,500 ‘votes’ while Buhari lagged behind with an abysmal 4,699 ‘votes’. It appears this poll portrays the pervasive disenchantment with the Buhari administration. At the peak of the #Change mantra and #SaiBaba frenzy in 2015, it is unthinkable that Atiku would trounce Buhari in a poll. Recall that the ruling APC has won every single opinion poll conducted by Daily Trust in the last 4 years (2014- 2018). Similarly, a recent online poll titled Atiku vs. Buhari: Who can manage the economy better? Conducted by Nairametrics, Nigeria’s leading financial literacy and business intelligence website, more than half of the respondents to the poll (55%) say Atiku will be able to manage Nigeria’s fragile economy better than Buhari. Presidential candidate of the SDP, Donald Duke came second with 24% of the poll, while President Buhari scored the least (21%) among the trio. Another poll conducted on www.politicsngr.com which lasted between May 21 – June 3, 2018, respondents were asked, ‘Will you vote for President Buhari in 2019’? 5,227 votes were recorded. Of the figure, 3,687 votes representing 70 per cent voted against Buhari re-election bid while 1,538 votes representing 29.4 per cent supported his ambition. Politicians and their foot soldiers are seemingly the most optimistic people in the world. I am reminded that a week, let alone four months to a presidential election is a long time in politics. I think insecurity and more importantly the economy would tilt the balance in the 2019 presidential election. People, Nigerians are suffering! Allan J. Lichtman, distinguished professor of history at American University who correctly predicted 30 years of United States Presidential elections including that of Trump which many opinion polls got wrong, says, ‘’presidential elections don’t work the way we think they do,” “They’re not decided by the turns of the campaigns, the speeches, the debates, the fundraising. Rather, presidential elections are fundamentally referendum on the performance of the party holding the White House. If that performance is good enough, they get four more years. If it’s not, they’re turned out and the challenging party wins.” I think Prof Lichtman’s hypothesis pertinent to Nigeria. If the current mood of the nation, open source, social media intelligence is anything to go by, the odds are against President Buhari. Barring any unforeseen circumstances, hate or love him, Atiku is in all probability, the next president of Nigeria.